artemis and wally. i laughed SO hard when i first read it. Wallpaper and background images in the Young Justice club tagged: kid flash artemis wally megan young justice. That is verey hard 2 do!! Too hard! I'm surprised Wally even tried. Actually no. 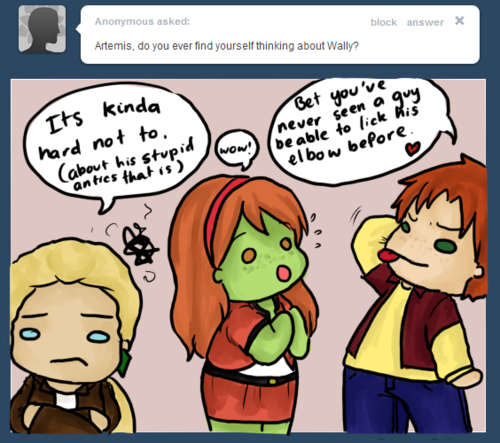 Wally's a little childish with his flirting and he acts stupid so...Yeah I can see Wally doing that! My cousin broke his amr trying to do that it was really stupid I told him it wouldnt work on the phone then I heard a 'thud' and a him saying I think I just broke my arm but I did it! It's okay I was laughing to the doctor said (and I laughed the entire time while he told me) he nearly dislocated his shoulder bone and broke his arm. Then he asked what he did and he told him and then the doctor shot him a look and he shouted "But I did it and it was totally worth it!" My cousin is my favirote he does stupid things but I can ushally fix his he tired to do a back flip an ddid a Wally face plant into the door. I laughed then to. I like your pic! It's not impossible to lick your elbow if your arm can bend the other way naturally. mine can and it doesn't hurt to lick your elbow.